Pamela enjoys speaking to book clubs, civic organizations, and writers groups. Please contact her if you’d like her to speak to your organization or book club in person or via videoconference. Preserving Your Cultural and Family History: Why you should be your family scribe and how to do it. Hush Your Potty Mouth: Colorful, useful curse word substitutions for mothers, fathers, teachers, broadcasters, and writers when they want to say $@!&# and can’t or shouldn’t. All Things Southern: It’s more than the accent and the food. Southern Sass: Proof all Southerners are born storytellers. Contest Diva Tells All: What writing contests can do for you and your career. Gold to Sold: Takes you behind the wheel to navigate the lanes of the writing highway—from rejections and early contests to Golden Heart® finalist to that first publishing contract. Have you ever heard a woman going through a divorce say, “It would have been easier if he’d died.” Have you said it? Thought it? But what if he did die? 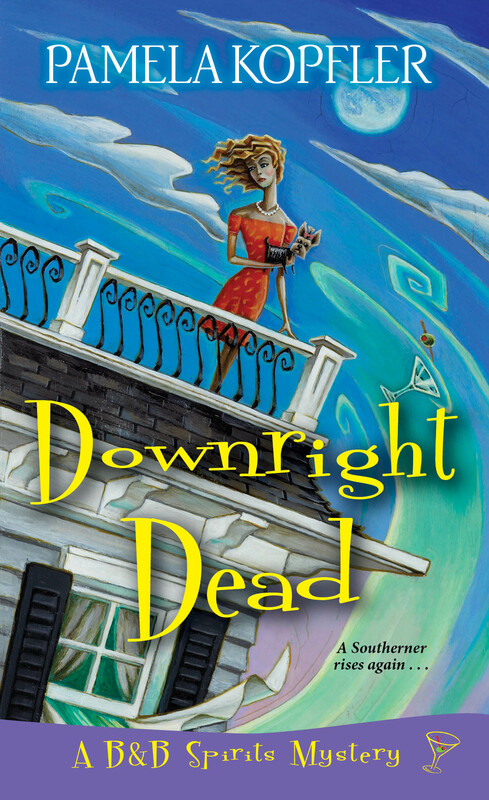 Southern-fried and sassy, Pamela writes award-winning humorous mysteries with a kick of Southern sass. She is a four-time Golden Heart® finalist and a Daphne du Maurier award winner. 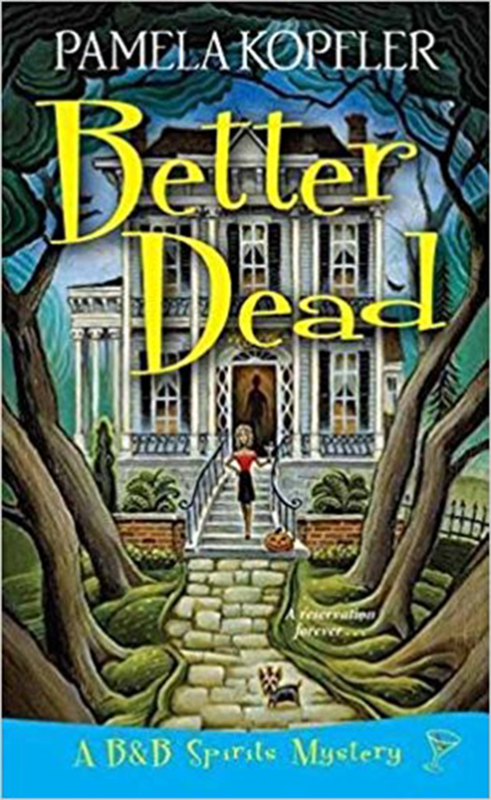 Her debut novel, BETTER DEAD, is the first in her B & B Spirits mystery series, Kensington Books 2018. She can stir up a roux, mix a cocktail, and loves swapping stories. Pamela lives in South Louisiana where the spirits are restless, the food is spicy, and the living is divine. Visit pamelakopfler.com for lagniappe (a little something extra). BETTER DEAD was inspired during a writers’ retreat at Nottoway Plantation in Louisiana. The organizer challenged the authors to write a ghost story in the spirit of Lord Byron’s challenge to Mary Shelly to write a supernatural story at a retreat in 1816. Shelly gave us the classic Frankenstein. Pamela twisted Frankenstein and added a funny bone when she remembered a lament of many women going through divorce. “It would have been easier if he’d just died.” But what if he did die and he came back as a ghost? That thought sparked the premise for BETTER DEAD. Putting words on the page keeps Pamela’s alligator mouth from overloading her hummingbird heinie in real life. It doesn’t hurt to be married to a saint who is an attorney either. She can stir up a roux, mix a cocktail, shoot anything (as long as it doesn’t have eyes), and loves swapping stories. She marks her time on earth by the lives of the dogs she has loved and who often show up in her stories. Follow Pamela at Facebook, Twitter, Instagram, Goodreads, and Amazon. She’d love to see you there! Sign up for her occasional newsletter at https://pamelakopfler.com for lagniappe (a little something extra)~~Unique cocktail recipes, finger-licking-good Southern recipes, sassy short stories, news about new books, giveaways, and sales!